ESTD 1869. Pasta in our delicious cheese sauce. 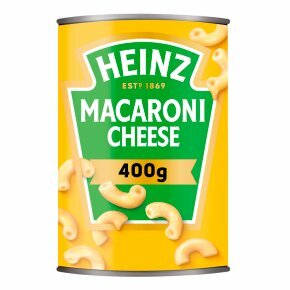 Heinz Macaroni Cheese tastes so deliciously flavoursome because it is made with creamy Cheddar cheese. Did you know that our appetising recipe is also low in fat? (850W): Microwave ovens vary. The following is a guide only. Empty contents into a microwaveable container and cover. Heat on full power for 1 1/2 minutes. Stir, then heat for a further 1 minute. Check that product is hot before serving.Microwave in 2 1/2 minutes. Empty contents into a saucepan and stir gently while heating. Do not boil.